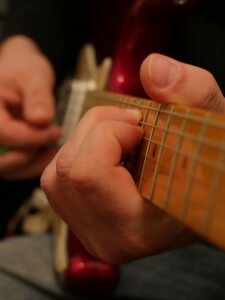 Andy Robson is available for fundamental guitar lessons to a certain number of beginner and advanced learner. In recent years, he passed his knowledge on to 4-5 learner weekly with passionate success. His lessons contain plain chord play a.k.a. song accompaniment ,blues-, rock-, pop- and funk executions, precise coaching for guitar play within a band, solo play, coaching for music theory, harmonies, rhythm, special sound system and equipment. You can choose between 2 studios in Berlin ( Friedenau or Neukölln). When available, Andy will also offer a trial lesson free of charge. Andy Robson works for the non-profit organisation Berlin WeTeK since 2008. He tutors band workshops in the areas youth and culture. The project “Rockmobil” is a joint team of educators and musicians. This “Rockmobil” offers band workshops in public schools, youth recreation centres and correctional facilities aiming to share and promote music and the experience to play in a band. They want to inspire adolescents and grown-ups to learn a new instrument. 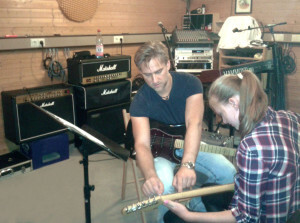 At times they also make their workshops available to advanced musicians. So if you are interested in the “Rockmobil”-experience, you can contact Andy Robson. You can also book tailored workshops meeting your special wishes like exclusive workshops, that focus on professional band coaching with more than one tutor.